The giraffe is related to other even-toed ungulates, such as deer and cattle, but is placed in a separate family, the Giraffidae, consisting of only the giraffe and its closest relative, the okapi, and their extinct relatives. Its range extends from Chad in Central Africa to South Africa. Giraffes usually inhabit savannas, grasslands, or open woodlands. However, when food is scarce they will venture into areas with denser vegetation. They prefer areas with plenty of acacia growth. They will drink large quantities of water when available, which enables them to live for extended periods in arid areas. The giraffe's fur may serve as a chemical defence, and is full of antibiotics and parasite repellents that gives the animal a characteristic scent. Old males are sometimes nicknamed "stink bulls". There are at least eleven main aromatic chemicals in the fur, although indole and 3-methylindole are responsible for most of their smell. Because the males have a stronger odour than the females, it is also suspected that it has a sexual function. The giraffe has one of the shortest sleep requirements of any mammal, which averages 4.6 hours per 24 hours. The name giraffe has its earliest known origins in the Arabic word الزرافة ziraafa or zurapha, perhaps from an African name. It appears in English from the 16th century on, often in the Italianate form giraffa. The species name camelopardalis (camelopard) is derived from its early Roman name, where it was described as having characteristics of both a camel and a leopard. The English word camelopard first appeared in the 14th century and survived in common usage well into the 19th century. The Afrikaans language retained it. The giraffe is one of only two living species of the family Giraffidae, along with the okapi. The family was once much more extensive, with over 10 fossil genera described. The giraffids evolved from a 3 m (9.8 ft) tall antelope-like mammal that roamed Europe and Asia some 30–50 million years ago. The earliest known giraffid was Climacoceras, which still resembled deer, having large antler-like ossicones. It first appeared in the early Miocene epoch. Later examples include the genera Palaeotragus and Samotherium, which appeared in the early-to-mid-Miocene. They were both tall at the shoulder, and had developed the simple, unbranched ossicones of modern giraffids, but still had relatively short necks. From the late Pliocene onwards, the variety of giraffids drastically declined, until only the two surviving species remained. The modern genus Giraffa evolved during the Pliocene epoch, and included a number of other long-necked species, such as Giraffa jumae, that do not survive today. The giraffe was one of the many species first described by Linnaeus in 1758. He gave it the binomial name of Cervus camelopardalis in the 10th edition of his Systema Naturae. Brisson erected the genus Giraffa in 1762. G. c. camelopardalis, the nominate subspecies, is known as the Nubian Giraffe. Its coat pattern has large, four-sided spots of chestnut brown on an off-white background and no spots on inner sides of the legs or below the hocks. It is found in eastern Sudan and northeastern DR Congo. It has been estimated that fewer than 250 remain in the wild, but little is known about this subspecies and consequently this estimate is labelled with great uncertainty. It is very rare in captivity, although kept at Al Ain Zoo in the United Arab Emirates. G. c. reticulata, known as the Reticulated or Somali Giraffe, has a coat pattern of well defined patches that are normally a bright orange-brown colour. These patches have sharp edges and are separated by bold, bright white lines. It ranges from northeastern Kenya, into southern Ethiopia and Somalia. It has been estimated that fewer than 5.000 remain in the wild, and based on ISIS records it is among the most common in zoos, with more than 450 kept. G. c. angolensis, the Angolan or Smoky Giraffe, has large spots with some notches around the edges, extending down the entire lower leg. It is found in southern Angola, northern Namibia, southwestern Zambia, Botswana and western Zimbabwe. It has been estimated that fewer than 20,000 remain in the wild, and based on ISIS records approximately 20 are kept in zoos. G. c. antiquorum, the Kordofan Giraffe, has smaller, more irregular spots that cover the inner legs. Its distribution includes southern Chad, Central African Republic and northern Cameroon. Populations in Cameroon were formerly included in G. c. peralta instead, but this was incorrect. Fewer than 3,000 are believed to remain in the wild. Considerable confusion has existed over the status of this subspecies and G. c. peralta in zoos. In 2007 it was shown that all "G. c. peralta" in European zoos actually are G. c. antiquorum. Consequently, approximately 65 are kept in zoos based on ISIS records. G. c. tippelskirchi, known as the Maasai Giraffe or Kilimanjaro Giraffe, has jagged-edged, vine-leaf shaped spots of dark brown on a brownish-cream background. It is the darkest coloured subspecies. It occurs in central and southern Kenya and Tanzania. It is estimated that fewer than 40,000 remain in the wild, and based on ISIS records approximately 100 are kept in zoos. G. c. rothschildi, is known variously as the Rothschild Giraffe or Baringo Giraffe or Ugandan Giraffe. Its coats bears deep brown, blotched or rectangular spots with poorly defined cream lines. Its legs are mostly white with no pattern. Its range includes Uganda and west-central Kenya, especially near Lake Baringo. It may also occur in southern Sudan. Fewer than 700 are believed to remain in the wild, and based on ISIS records more than 450 are kept in zoos. G. c. giraffa, the South African Giraffe, has rounded or blotched spots, some with star-like extensions on a light tan background, running down to the hooves. It is found in northern South Africa, southern Botswana, southern Zimbabwe and southwestern Mozambique. It is estimated that fewer than 12,000 remain in the wild, and based on ISIS records approximately 45 are kept in zoos. G. c. thornicrofti, called the Thornicroft Giraffe or Rhodesian Giraffe, has star-shaped or leafy spots extend to the lower leg. It is restricted to the Luangwa Valley in eastern Zambia. Fewer than 1,500 remain in the wild, and based on ISIS records none are kept in zoos. 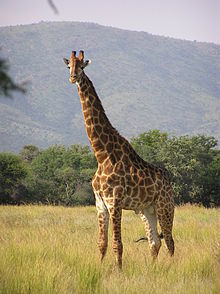 G. c. peralta, commonly known as the West African Giraffe or Nigerian Giraffe, has numerous pale, yellowish red spots. It is endemic to southern Niger. With fewer than 220 individuals remaining in the wild, it is the rarest giraffe subspecies. Giraffes in Cameroon were formerly believed to be this subspecies, but are actually G. c. antiquorum. This has also resulted in some confusion over its status in zoos, but in 2007 it was established that all "G. c. peralta" kept in European zoos actually are G. c. antiquorum. Formerly, the Kordofan and West African Giraffes were regarded as a single subspecies, but genetic evidence has confirmed that they represent two separate subspecies. Comparably, the Rothschild's Giraffe has been considered a hybrid population, but genetic evidence has confirmed that it is a valid subspecies. By contrast, scientists have proposed four other subspecies — Cape Giraffe (G. c. capensis), Lado Giraffe (G. c. cottoni), Congo Giraffe (G. c. congoensis), and Transvaal Giraffe (G. c. wardi) — but today none of these is widely accepted. One genetic study on Smoky Giraffes suggests that the northern Namib Desert and Etosha National Park populations are distinct subspecies.